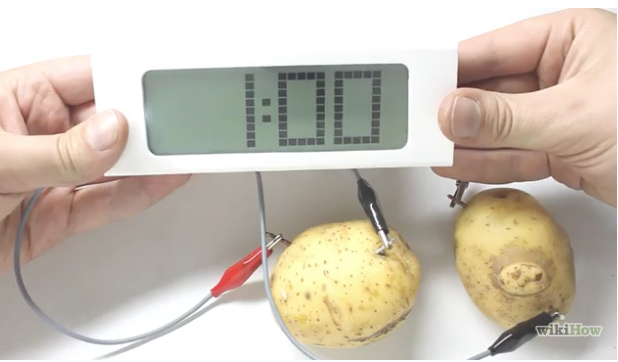 Baked potatoes, mashed potatoes, French fries and homemade clocks, what do they have in common? They all start with potatoes! 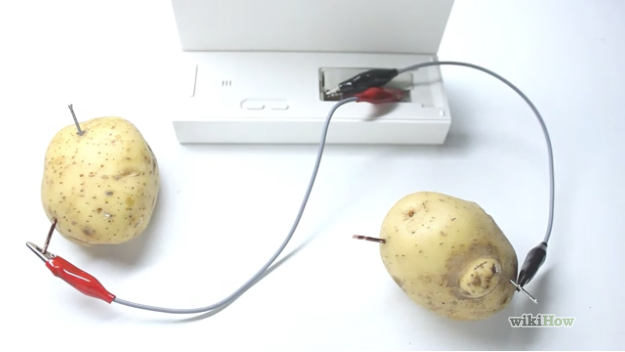 That’s right, potatoes don’t just provide you with energy when you eat them, thy will also power a clock. 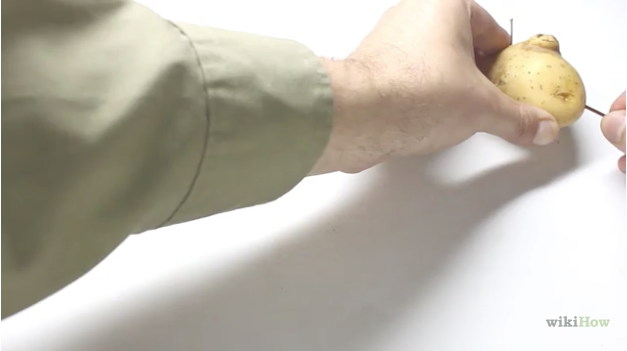 This is an easy, at-home science project that will demonstrate how we can supply our energy needs in ways other than just flipping the switch on the wall. Potato clocks are fun and easy to assemble, but first you’ll need to gather some basic supplies. 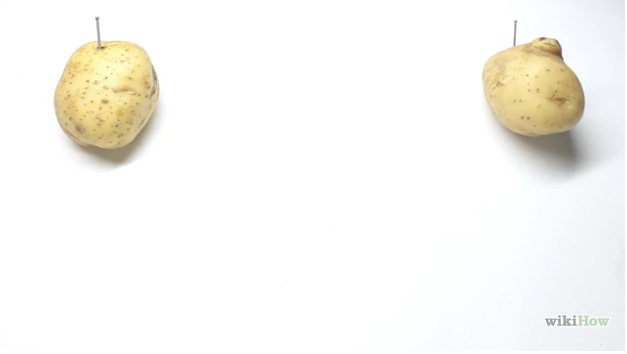 2 large clean potatoes, or 2 halves of a large potato. The nails, copper nails, or copper wire, can be found at most hardware stores. Most hardware stores also carry jumper wires with alligator clips, but if yours doesn’t they can also be found at electronics stores. If you are having trouble finding supplies, JM Cremps carries the complete Potato Clock Kit along with other science projects for kids. First, assemble the items you need, and then let’s get started! Step 1: Separate the two potatoes. 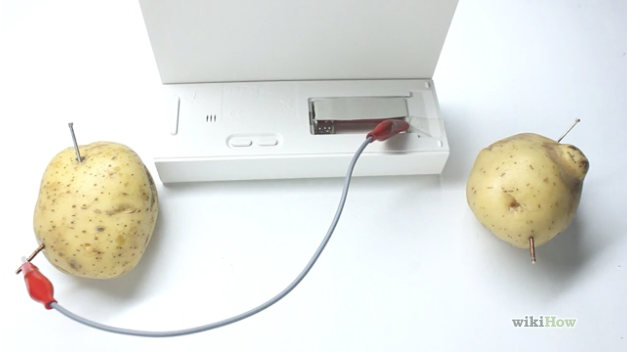 Each potato works as a “galvanic cell,” releasing electrical energy through chemical reactions. Call one potato A (or 1), and the other potato B (or 2). Here’s the Science: The bulk of the potato just serves as a case for the cell, holding everything in position. The potato juice serves as the “electrolyte,” in which charged atoms and molecules called “ions” dissolve and can flow over time. The dilute phosphoric acid in it also provides hydrogen ions for the reaction. Some atoms (or molecules) strongly attract extra electrons and become negatively charged ions, called onions (“an-ions”); others are easily stripped of some electrons and become positively charged “cations” (“cat-ions”). Each element attracts electrons with different force, due to the differing charge of protons with which their nucleus attracts electrons and the manner in which the marginal “valence” electrons arrange themselves around the nucleus and other electrons. The potato juice has dilute phosphoric acid, some of which dissolves dissociated into as hydrogen cations (basically) and phosphate anions. Step 2: Place one galvanized nail in each potato. Step 3: Place one copper nail or wire piece into each potato ensuring that the nails don’t touch. At this stage it is really important to understand that this experiment will work only if the galvanized nails and the copper nails/wire are as far apart as possible on the potato because the distance between them is what generates the power. Step 4: Remove the battery compartment lid from the clock. If there is already a battery in it, remove it. Take notice of the battery’s polarity in relation to how it connects to the clock. Step 5: Connect the first jumper wire from the copper nail or wire of potato A to the positive terminal of the clock. To do this, take one jumper lead and attach the alligator clip to the copper nail or wire and then the other end’s alligator clip to the positive terminal (denoted by the symbol + ). Step 6: Connect the second jumper wire from the galvanized nail of potato B to the negative terminal of the clock, denoted by the symbol “-“. When you stick the zinc electrode (the plating on the galvanized nail) and the copper electrode (the copper nail or wire) in the potato, each metal, having less electron affinity than the hydrogen ions, would tend to have its atoms stripped of their electrons by the hydrogen ions. The neutral hydrogen atoms would join together into hydrogen gas molecules and escape; the metal cations would tend to disperse away and more hydrogen diffuse in to continue the reaction slowly bubbling away the acid’s hydrogen and consuming the metals. Zinc has even less electron affinity than copper. So, if you connect the electrodes with a conductor, the wire, some electrons will tend to flow in it from the zinc to the copper. The removal of some electrons from the zinc electrode will make a few of its atoms fall off as cations and be dissolved away. The excess of electrons at the copper will make hydrogen preferentially take them up there, but also tend to make the copper keep its electrons and not be corroded (or, more precisely, shift the reaction equilibrium so that the copper ions that do fall off tend to regain electrons and reattach for little or no net corrosion). The removal of electrons from the copper and the addition of electrons to the zinc would tend to build up areas of electric charge that would retard the reaction. But more electrons keep conducting through the wire, and more hydrogen and zinc ions keep dispersing through the potato to maintain fresh solution at each electrode, to keep the reaction going. The force with which the copper thus draws the electrons can be used to do work, like run a clock. Step 7: Connect the third jumper wire to the galvanized nail of potato A. Then connect its other end to the copper nail of potato B. By this stage all three jumper leads are interconnected and the clock should be functioning. Step 8: Check the clock. The reaction slows as the zinc metal and the hydrogen ions are depleted. The force with which the hydrogen pulled the electrons off the zinc, in a very roundabout way, is what the cell makes available to you for work–with a little being “wasted”, of course. Wiring the potato cells end-to-end makes a “series circuit”, pulling the stream of electrons through the clock with twice as much force as one potato would apply. It also makes them properly called a “battery”, because you’re using more than one electrochemical “cell”. Once it’s working, why not set the time on the clock to the current time! If the clock doesn’t work, check that all connections are secure and in the right order, and double-check the polarity of the clock. 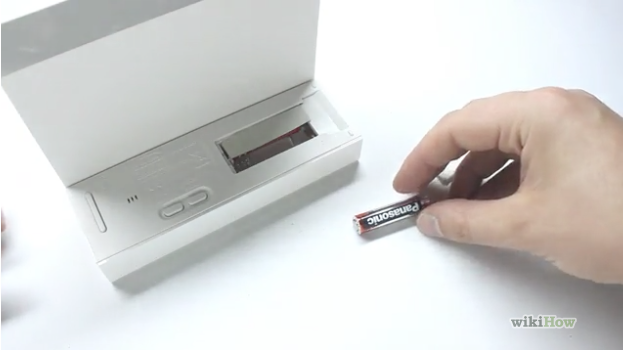 If it still doesn’t work, your clock might require more power than the very little a vegetable battery can provide. You can satisfy yourself that the battery is producing some electricity with a multimeter and measuring its voltage (electrical pressure) and current (electrical flow, amps). If you have to choose scales, choose very low ones: these batteries produce a volt or two and a few milliamps. Click here to see the animated version of these instructions. The instructional portion of this article was provided by wikiHow, a wiki building the world’s largest, highest quality how-to manual. 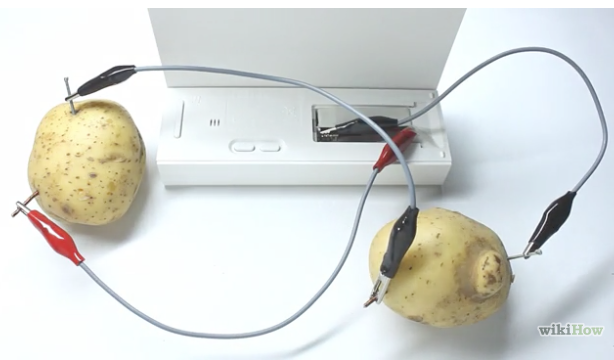 Please edit this article and find author credits at the original wikiHow article on How to Make a Potato Clock in 9 Steps. Content on wikiHow can be shared under a Creative Commons License.